Extra-large pulp bin lets you juice longer and add nutrient-rich pulp to any recipe. Stainless steel strainer basket with cleaning brush for easy pulp removal. 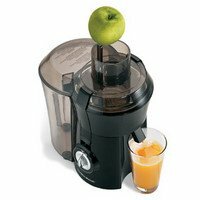 MSRP $89 Based on the Manufacturer's Suggested Retail Price, this juicer is less expensive than average and is priced in the bottom 24% of juicers. Premium Features 3 When compared to other juicers, this appliance has more premium features than average and ranks in the top 33% of juicers. Star Rating 4.3 User reviews, ratings, and feedback indicates that this juicer is rated about average by 100 users when compared to other juicers.